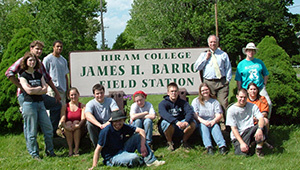 Nestled in rural Portage County thirty-five miles southeast of Cleveland, the Silver Creek property is adjacent to the Hiram College's James H. Barrow Field Station, a center of research and environmental studies. The field station was established in 1967 to provide Hiram College students the opportunity to supplement classroom activities with hands-on learning experiences, but has expanded its reach so that the public also has the opportunity learn more about Ohio's natural history. The Trust for Public Land helped protect 132 acres of the site in 2004, increasing the size of the field station to nearly 400 acres. In 2012, The Trust for Public Land assisted Metro Parks Serving Summit County to expand the park’s trail system onto the new acreage while conserving its emergent wetlands and enhancing its riparian corridors. This project also brings the park district one step closer to realizing a long-term plan to connect Silver Creek to a county-wide trail and greenway system surrounding Greater Cleveland based on watershed protection and recreational trails.